Plant nutrients removal is specific for different plant parts; main sinks are straw and grain, as can be seen in Tables 4.2 and 4.3. Removal of Si and K2O are particularly large if panicles and straw are taken away from the field at harvest. However, if only the grains are removed and the straw is returned and incorporated back into the soil, the removal of Si and K2O is greatly reduced, although significant amounts of N and P2O5 are still removed. Identification of the exact stage of growth is very important when determining the critical limits. A list of critical concentrations of various plant nutrients in the rice plant, which may be used as a rough guide for diagnostic purposes, is presented in Tables 4.4 & 4.5. The most variable step is the process of soil sampling. Soils are inherently variable between fields and within fields. Therefore, correct soil sampling procedures should be followed so that soil test results for lime and other nutrient recommendations are representative of the entire field. The second step in the soil testing process is the chemical analysis of the soil conducted by a soil testing laboratory. Availability of nutrients, such as phosphorus, potassium, calcium and magnesium, in some rice growing countries, are determined with the Mehlich 3 extraction. Some laboratories use different chemical methods to determine the availability of these nutrients. Therefore, the numbers that are generated may not be easily comparable. Also, the units in which the nutrients are expressed (such as kg/ha or parts per million) cause problems in comparing numbers if they are not understood. The last step in the soil testing process is data interpretation and development of recommendations. Once the numbers have been generated by the laboratory, someone must decide what they mean. The two ideas that drive soil testing programs are “fertilize the crop” and “fertilize the soil.” The idea of “fertilize the crop” is that fertilizer recommendations are based on crop response at a given soil test level. The second idea of “fertilize the soil” is that fertilizer recommendations are based on the needs of the current crop with an additional amount recommended to attempt to build soil fertility levels. *** The range of concentrations listed for the specific plant parts is considered normal for plant growth and production. Concentrations lower than those listed may limit production and result in visual nutrient deficiency symptoms (ppm = mg/kg). Among the soil analysis techniques, determination of soil pH is the simplest and most informative analytical technique for diagnosing a nutrient deficiency or toxicity problem. Soil test results from a given field vary depending on what type of extraction solution is used. Soil test P values which use Bray-1 P extraction solution, will differ from values reported that use Mehlich-3 extraction. As a rough approximation, multiplying Mehlich-3 P values by 0.75 will compare with Bray-1 P levels. Precise prediction of fertilizer P requirements of soils used for the production of rice has been difficult. Experiments have shown that rice yield in many flooded soils was not increased by P application despite low soil test-extractable P as measured by common soil test methods (ammonium acetate-EDTA (AA-EDTA), Bray 1, Olsen). Conventional soil test methods frequently do not accurately assess the capacity of flooded soils to supply P.
Phosphorus availability increases under flooded conditions. The causes of increased P availability following reduction have been described as reductive dissolution of Fe+3 oxides and the liberation of sorbed and occluded P, changes in soil pH that affect solubility of P-compounds, and the desorption of P from surfaces. However, the effects of mineralization of soil organic P and reductive dissolution of Mn oxides are considered minor or negligible sources of P release during flooding. Phosphorus deficiency occurs widely in rice soils with a high native P-fixing capacity that is associated with poorly crystalline Fe oxides. P transformation, sorption, and desorption are controlled by changes in the levels of amorphous Fe. More native insoluble P is released under reduced than under oxidized conditions and there is a significant correlation between P-sorption parameters and all forms of Fe. Rice response to P fertilizer is common in soils that do not have high P-fixing capacities and in soils with a rice-wheat system. Increased available P supply in flooded rice soils is attributed mainly to the large quantities of reductant-soluble soil P residing in poorly crystalline Fe oxides. Accurate prediction of rice response to applied P is possible by measuring soil test-extractable P under reduced (anaerobic) soil conditions by common soil test methods or by measuring oxalate extractable P (that associated with poorly crystalline Fe oxides) under oxidized or reduced soil conditions. One particular explanation for the failure of soil test methods to identify P-deficient soils may be increased P diffusion through soils to rice roots after water saturation or flooding a soil. Rates of P transport to roots are more limiting than the rates of P uptake at the root surface. The root-uptake mechanism actually constrains P-use efficiency. Rice plants (Oryza sativa L.) grown on soils containing low soil test extractable P frequently do not respond to fertilizer P application under reduced conditions. The lack of rice response to fertilizer P in soils with low extractable P has been attributed to increased solubility of Fe-associated P upon flooding. The increased solubility of Mn oxides and release of Mn-associated P in flooded soils may also increase P availability to rice plants. Phosphorus bonds easily to soil minerals, forming compounds that are insoluble. Its availability to plants is largely controlled by soil pH. At pH< 5.0, phosphorus binds to iron minerals, while at a pH> 7.4 it readily binds to calcium minerals. Phosphorus bound to iron or calcium is not available to plants. Generally only 10 percent of the total phosphorus in the soil is available to plants at any given time. The other 90 percent, while not immediately available, will gradually become available as soil bacteria break it down. Soil test will reveal only the plant-available phosphorus, but fertilizer recommendation also reflects the other 90 percent. Soil P availability under dryland conditions is influenced by several factors, not the least of which is soil pH. Optimum availability of P occurs in the pH range of 6.0-6.5. With acidic conditions, P is predominantly sorbed by iron (Fe) and aluminum (Al) oxides. The sorption of P by Fe and Al oxides decreases as soil pH increases, and more P is sorbed by calcium (Ca) and magnesium (Mg). At either extreme, P is not readily available. When a permanent flood is established, redox reactions result in reduction of trivalent Fe (Fe3+) to divalent Fe (Fe2+). As this occurs, the solubility of the Fe oxides increases. This leads to a subsequent increase in P availability to rice. On alkaline soils, however, more P is sorbed as Ca and Mg phosphates. Because Ca and Mg are not influenced by redox reactions associated with flood establishment, the solubility and subsequent availability of P are not necessarily increased substantially after flooding. Therefore, soils that have limited available P prior to flooding will continue to have limited available P after flooding. Soil testing is the key to profitable phosphorus fertilizer use. Research shows that when soil contains more than 35 kg Bray-1 P per hectare of phosphorus, the addition of more phosphorus will probably not increase rice yields. However, rice will remove 0.35 kg phosphorus per 45 kg of grain. This will need to be replenished, so soil test recommendations often include a maintenance addition reflecting anticipated yield goal. Flag leaves were found to have greater tissue levels than lower leaves for each K fertilization level. This difference is greater at 10% heading than at internode-elongation zone. 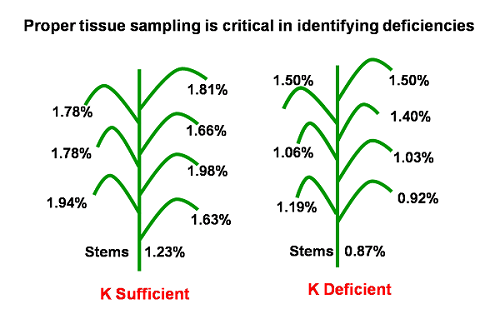 The tissue K levels of lower leaves are better correlated to yield than flag leaves. Potassium fertilizer is recommended on soils that test less than 200 kg/ha of K (Table 4.8). Potassium fertilizer recommendations are based solely on soil K levels, regardless of soil salinity. The salts added by recommended amounts of K fertilizer are small compared to the amount of salts in an existing saline soil. Soils that test < 140 kg/ha of K are very susceptible to K deficiency and should get extra fertilizer to satisfy crop requirements and build soil test K(Table 4.8). Recommendations are based on soil test K and should help build soil K levels when soil test K is low, because rice removes a low amount of the total K that is taken up. It should be remembered that immediately after harvest of any crop the K not removed by grain may still be in the straw. Thus, soil test K should increase as K leaches from straw back into the soil with time. The critical limits for micronutrients using soil analysis are presented in Table 4.10. * If the soil pH> 6.8, Zn-deficiency is most likely to occur, particularly if the variety grown is not tolerant and has low Zn usage efficiency. A clear understanding of the different stages of growth and development of the crop and its nutritional requirements at these important stages is a pre-requisite for nutrient management. In the case of N, the accumulation of N in the vegetative body is high during the initial growth stages and declines with age towards the later growth stages. Translocation of N from the vegetative organs to the grains becomes significant only after flowering. There is some translocation of carbohydrates from the vegetative plant parts to the grains after flowering and a large amount of carbohydrates accumulates in the grains. Protein synthesis is active during the vegetative stages and during the reproductive stage. Synthesis of cell wall substances (cellulose, lignin, etc.) becomes active, although the pace of protein synthesis also continues. It is only at the ripening stage that starch synthesis becomes active. Nutrient mobility in the rice plant is in the sequence P > N > S > Mg > K > Ca. The elements that form immediate components of proteins have a high rate of mobility, while those that are continuously absorbed until senescence have a relatively low mobility. Thus, N, P and S, which are essential constituents of proteins, are absorbed rapidly during the active vegetative growth stage and are subsequently translocated to the grain after flowering. Other nutrients like Ca and K on the other hand, are absorbed at a rate matching the rate of dry matter production over the growth period. The content of N, P and K at the seedling stage increase progressively with growth and then decrease after reaching a maximum. The content of N in the plant decreases marginally after transplanting and then increases until the initiation of flowering. Subsequently the N content decreases continuously until the dough stage and then remains constant until ripening. The content of P declines rapidly after transplanting, then increases slowly and reaches a peak at flowering and then decreases until the dough stage. The content of K and Ca decreases gradually during the earlier growth of the plant but increases from flowering until ripening. The content of Mg is high from transplanting to the mid-tillering stage and then decreases gradually. The content of S decreases with growth.